El basamento piramidal supera los 18 metros de altura, tuvo escalinatas orientadas hacia los cuatro puntos cardinales simbolizando las cuatro esquinas del mundo. En la parte superior se encuentra un pequeño santuario con puertas en las cuatro fachadas. 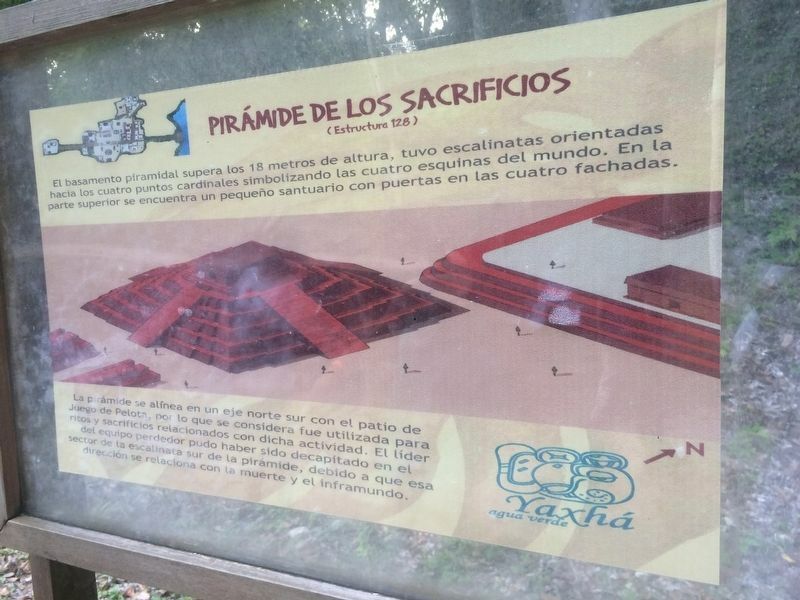 La pirámide se alinea en un eje norte sur con el patio de Juego de Pelota, por lo que se considera fue utilizada para ritos y sacrificios relacionados con dicha actividad. El líder del equipo perdedor pudo haber sido decapitado en el sector de la escalinata sur de la pirámide, debido a que esa dirección se relaciona con la muerte y el inframundo. The base of the pyramid exceeds 18 meters in height and had a stairway oriented to the four cardinal directions, symbolizing the four corners of the world. At the top is a small shrine with doors on all four sides. The pyramid is aligned on a north-south axis with the ball game court, so it is believed to have been used for rituals and sacrifices related to the ball game. The pyramid is in the background in this view. The leader of the losing team may have been beheaded near the southern stairway of the pyramid, because that direction is associated with death and the underworld. Location. 17° 4.414′ N, 89° 24.141′ W. Marker is in Melchor de Mencos, Petén, in Municipality of Melchor de Mencos. Touch for map. 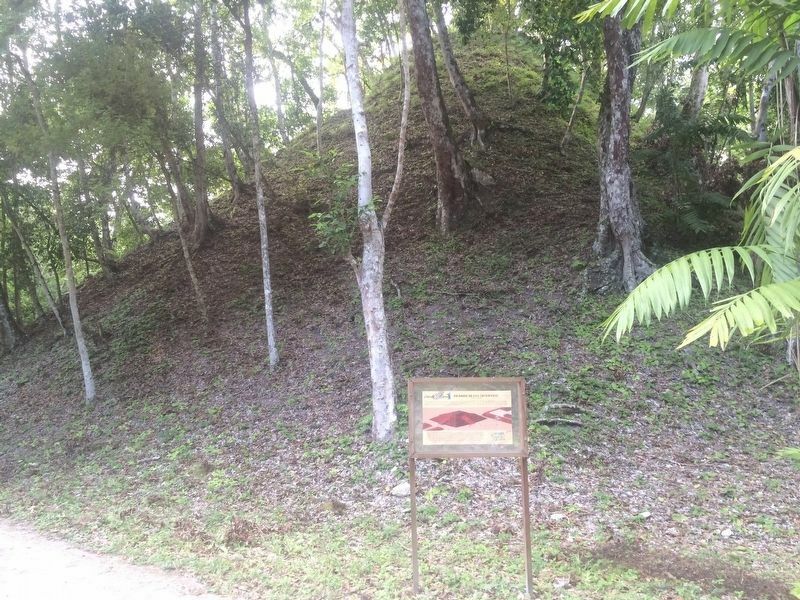 The marker is near Structure 128 and the Ball Court at the Yaxhá Archaeological Park. The park is some 5 kilometers north of the village of El Zapote, turning from the CA13 road. Marker is in this post office area: Melchor de Mencos, Petén 17011, Guatemala. Touch for directions. Other nearby markers. At least 8 other markers are within walking distance of this marker. The Palace's Ballgame (a few steps from this marker); Intersection of the Eastern and Quarry Causeways (about 90 meters away, measured in a direct line); The Plaza of the Birds (about 120 meters away); East Causeway Residential Zone (approx. 0.2 kilometers away); The North Acropolis at Yaxhá (approx. 0.3 kilometers away); The Quarry Causeway (approx. 0.3 kilometers away); Plaza of the Columns (approx. 0.4 kilometers away); The Eastern Acropolis of Yaxhá (approx. half a kilometer away). Touch for a list and map of all markers in Melchor de Mencos. More. Search the internet for Sacrificial Pyramid. Credits. This page was last revised on March 2, 2018. This page originally submitted on October 28, 2016, by J. Makali Bruton of Querétaro, Mexico. This page has been viewed 249 times since then and 8 times this year. Photos: 1, 2. submitted on October 28, 2016, by J. Makali Bruton of Querétaro, Mexico.